We returned Monday morning from Romer Johnson's three day charter, and it was a banner trip to say the least. Romer and the gang take three charters a year with us. The first one was slow, the second was pretty good, but this one was a home run. It felt great to show them some true wide open fishing to make up for the first trip earlier in the summer. This trip has a daytime departure, so we were baited up and clear of Point Loma by noon, with lines in the water by 3pm. We spent the day scratching at quality Dorado and picking a few Yellowfin Tuna as we worked our way down the coast. The next morning, we hit our first kelp right out of the grey and landed 50 Yellowfin Tuna. We then were invited to share in on a kelp with the Pacific Queen (thanks Captain Drew) where picked up about another 50 Yellowfin to fill out our daily limit. We travelled further down the coast and found a kelp at about 75 miles South of San Diego and picked up our daily limit of nice quality Dorado. The final day of our trip found us 115 miles down the coast where we quickly picked up our day limits of Yellowfin Tuna and a few more Dorado on a wide open bite on a school we found with the sonar that was off a kelp just cruising around. 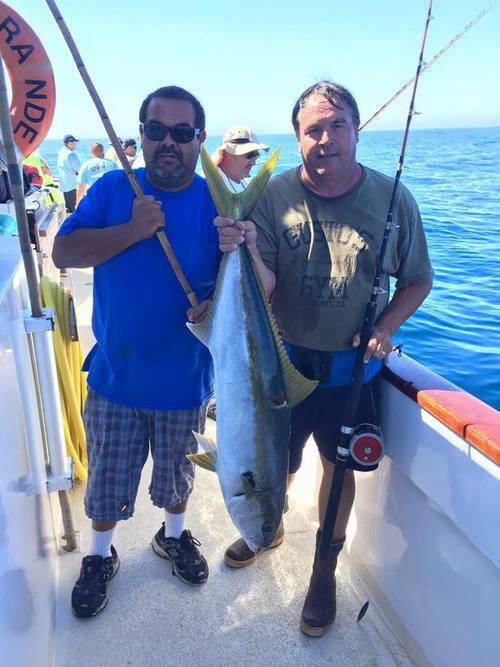 Fully limited out for the trip on tuna, we spent the rest of the day enjoying phenomenal fishing on 15 to 25 pound yellowtail. It was a blast! It was one of those trips where every part of the plan came together perfectly and the fish were cooperating everywhere we went. We have certainly been on the other end of the spectrum so it is always appreciated when a plan comes together. Thanks again for another fun trip and thanks for taking the time to organize these great charters Romer!